Americans’ positive feelings about the economy have officially returned to the level they were at on the eve of the Great Recession, according to a new study from Pew Charitable Trusts. While that might sound comforting, it doesn’t mean consumers are actually feeling secure in their own financial stability. Pew’s “Americans’ Financial Security” report [PDF] found that as the economy continues to recover a majority of consumers still face precarious financial situations. Consumers’ positive feelings about the economy have finally reached the same level as before the Great Recession. The report, based on a survey of 7,000 households and three focus groups, examined consumers’ perceptions of financial security and how their views differ based on income, wealth and other demographic factors. 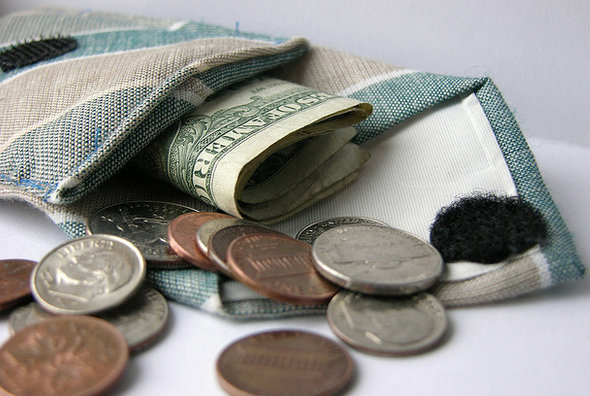 In all, the study found that consumers are mostly conflicted about their financial well-being. Nearly 56% of consumers surveyed say they would rate their financial situation favorably. 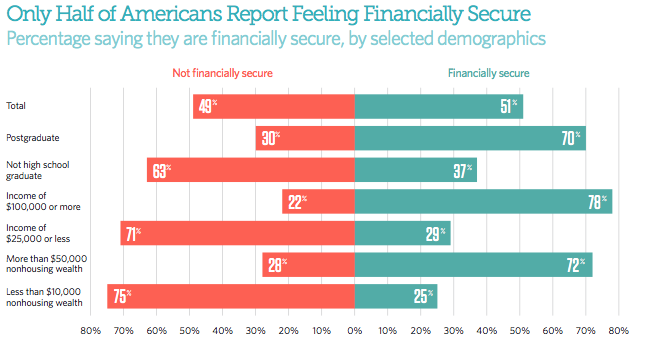 Americans are divided when it comes to their feelings of financial security. While consumers may have a positive opinion of their current financial situation, they appear to be cautious with only 51% of them saying they feel secure about their finances. When asked to define what financial security meant to them, most participants said it meant families have enough money to pay the bills, a little left over for small extras or savings, and few worries about making ends meet. Consumers’ responses to questions about financial emergencies and worries about finances show a stark contrast to earlier suggestions about respondents financial optimism. Nearly 57% of respondents say they are unprepared for a financial emergency, and another 57% say they worried significantly about their finances in the past year. Pew reports that many of those consumer should be worried about their finances given their lack of savings and the dismal increases in earnings over the last decade. Just 45% of respondents reported having a steady income and consistent expenses. To make matters worse, nearly 36% of the group reported having no savings. Additionally, many of the consumers polled reported barely breaking even or spending more than they make each month. While most consumers reported viewing the economy more favorably today than immediately after the great recession, many are still feeling the aftershocks. According to the report, nearly 8 in 10 households surveyed said they continue to suffer from events such as a drop in income, hospital visit, loss of a spouse or partner, or a major car or house repair in the past year. Researchers with Pew say that consumers’ move to favor financial stability over moving up the income ladder is likely a reflection of families’ desires to gain greater control over their financial situations. In fact, consumers feelings on the matter changed significantly in the last five years. Back in 2009, nearly 39% of Americans felt it was common for someone to start poor, work hard and become rich, while only 23% of respondents feel that way today. Pew concludes the report by calling for policymakers to continue focusing on helping Americans gain a steady financial foothold. “Ultimately, more work needs to be done to help families today and chart a path toward economic mobility in the future,” the report states.